Christmas shopping doesn’t need to be stressful. It should be fun, enjoyable, and if at all possible, paired with a mug of mulled wine and a bracing, crisp winter’s evening. Now, if all that festive spirit could be combined with a beautiful European city, and traditional crafts, food, and drink, wouldn’t that just be the icing on the Christmas cake? Of course it would. With a fantastic ice skating rink in the middle of the market square, and dozens of festively decorated shops around the edges, Bruges is a quaint and pretty little Christmas market. Not the largest in Europe, but certainly one of the most attractive! The stall holders sell everything from Christmas decorations to clothing, from food to drink, and a special kind of mulled wine called ‘gluhwein’ which has a cider base. Ideal for keeping warm whilst enjoying the gorgeous Christmas atmosphere. Bruges Christmas market is open from late November until early January (closed on Christmas Day). The Christmas market in Brussels (called Winter Wonders) is situated in the Place Sainte Catherine, and runs from late November until early January. Along with the usual festive stalls, shops, and activities, there are also live animation shows and specially designed illuminations to brighten up the wintery sky. TRIED AND TESTED! I visited the Christmas Markets in Brussels. 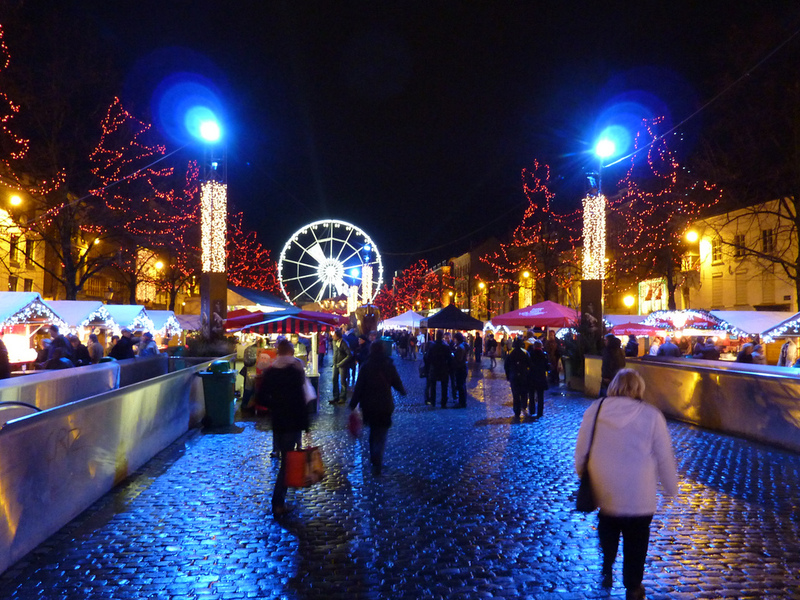 You can read my review of my Brussels Christmas Markets mini cruise here. It has only been going since 2000 (not long in Christmas market terms), but is now a staple in Brussels, and every year it just gets bigger and bigger. The ice rink, Ferris wheel, and roundabouts are perfect for adults and children alike, and the marching band with its accompanying Christmas carols is heart-warming and exciting in equal measures. There are, in fact, six different Christmas markets in Cologne, each one slightly different. It’s a good thing there is more than one, though, as with over four million visitors every December, one would just not be enough. Although each market has a different theme (including fairy tales and elves), and each one is in a different stunning location (such as in front of the cathedral), the goods that are available and the atmosphere that each one offers are similar, so it’s simple a question of picking the best one for you and enjoying it! The scale of each market is huge, and you are sure to find something unique to take back home to your loved ones. Food and drink (including gluhwein, and sugared chestnuts) are available to snack on, and much more can be taken away with you. From late November to late December the Christkindlmarkt in Salzburg is in full swing. It’s a lively, loud, and interactive market that combines traditional stalls selling beautiful crafts, delicious food, and boozy drink with carolling from superb Salzburg choirs to make for a stunning and incredibly festive way to shop. Not only that, but you may even be lucky enough to spot a glimpse of the ‘Christkind’ (the Christmas angel) as it makes its way through the crowds. He (or perhaps she) walks through the market each Saturday between 3.30pm and 6.30pm and is quite mesmerising. With around 180 different stalls, Nuremberg market is one of the biggest. It’s also one of the oldest, having first appeared in 1610! It has now evolved into a stunning place to shop, to eat, and to enjoy the many delights Nuremberg has to offer, such as the unique “Nuremberg Plum People” and the special Nuremberg gingerbread. Nuremburg Christmas market runs from late November until late December. Plan a short holiday to experience European Christmas Markets for yourself.